The Berkley Classic Base Only in Black is crafted with superior grade steel for maximum strength and rust protection. 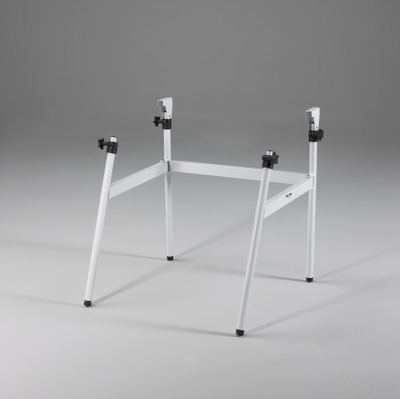 The Berkley Classic Base Only in Black is an adjustable base for any tabletop. It is manufactured with heavy steel to ensure that you get the most most life out of it. Steel is one of the strongest metals in the world, which means that the Berkley base can withstand an amount of friction and contact that would destroy the average base. This base can accommodate a table that is 24 x 36 inches, or it can hold something that has a 31.5 x 48 inch dimension. Furthermore, the base never has to take up space in a home or office environment. It can fold neatly away into a nearby closet or garage. Its foldability makes it highly mobile for business trips and family vacations. A practicing artist never wants to be without his or her workstation. This Table Base makes it possible for an artist to bring the world along.